Hypervisor Lab tests show upgrading PCs from Vista to Windows 7 could cause sound cards, DVD writers and other hardware to fail. In our test we set out to upgrade a Dell XPS 420 desktop PC from Windows Vista to Windows 7. The XPS 420 is about two years old, has a quad core Intel CPU, 3GB RAM, and 1TB of hard disk, so it seemed a reasonable candidate for such an upgrade. We were reassured to see reports from Upgrade Advisor that indicated we would have a few problems but by and large the upgrade would be successful. For example, Upgrade Advisor warned us about a problem with our Roxio Creator Premier 10.1 software, which was supplied by Dell when we bought the PC and is used to burn CD-Roms and DVDs. Upgrade Advisor directed us to the Roxio web site for further information. Unfortunately the Roxio website simply told us we needed to buy Roxio Creator 2010($79.90). 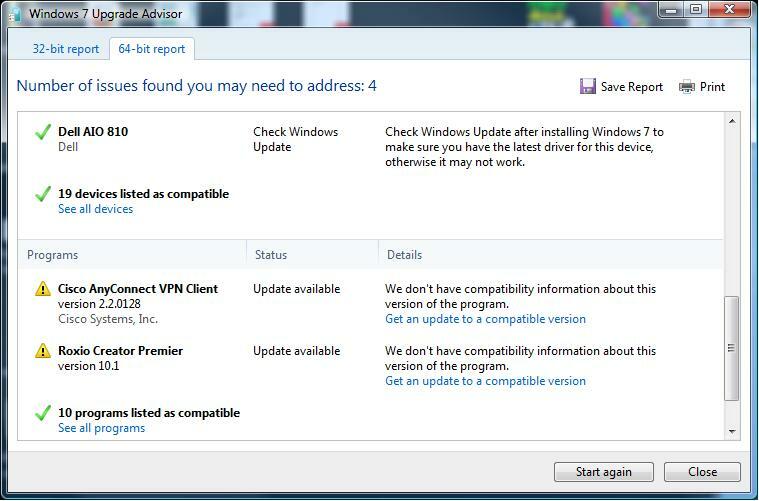 Upgrade Advisor produced two sets of reports, one about compatibility with the 32-bit version of Windows 7, and one for the 64-bit version. Unfortunately it didn’t address the question of which of these two versions to choose. On the one hand, Upgrade Advisor said we could upgrade our 32-bit Vista software to the 32-bit Windows 7. But if we took this route it said we should uninstall many of our applications before the upgrade. It did not point out this option would also mean we could not easily switch back to our Vista environment if the upgrade was unsuccessful. In contrast, Upgrade Advisor said if we wanted to install the 64-bit version of Windows 7 we could not upgrade our existing 32-bit Vista software and would need to make a clean installation. It didn’t tell us if we went this route, we could install Windows 7 onto a different hard disk and leave our existing Vista system intact. This way, if we wanted to switch back to our old Vista environment, it would be ready and waiting on its original hard disk. Given that we could expect better performance from the 64-bit version of Windows 7, and given the 64-bit version would eventually be better supported than the 32-bit one, and because a 64-bit install would leave our Vista environment untouched, we opted to install the 64-bit version. Although we were happy with the new Windows 7 environment, it turned out there were a few problems Upgrade Advisor did not warn us about. For example, Upgrade Advisor said our sound card was compatible with Windows 7. Unfortunately it didn’t work properly following the upgrade. Although it could play sounds, we couldn’t use a microphone or the line input. Similarly, Upgrade Advisor told us to download an update for our NetGear RangeMax USB wireless adapter. It turned out the latest version of NetGear software did not work properly with Windows 7, but an automatic update from the Windows Update service included a patch that made our WiFi adapter work properly. We were also disappointed by the lack of information and suitable software on the Dell web site. For example, there was no information about upgrading the XPS 420 workstation. And although we had purchased our PC with a Dell Bluetooth wireless keyboard and mouse, Dell’s website had no information or software for using them with Windows 7. Instead we needed to use a search engine, and found our keyboard and mouse were actually made by Logitech, and that we could download suitable software from the Logitech web site. Our verdict is that while buying a new PC with Windows 7 is fine, actually upgrading an existing system to Windows 7 is not for the faint hearted. If you try it you’re likely to have problems locating software to make peripherals such as sound cards, printers and wireless gadgets work properly. We eventually got most of our kit working properly, but only after buying a new version of the Roxio DVD burning software. This article was published on Friday, March 19th, 2010 at 3:15 pm. You can follow any responses to this article through the RSS 2.0 feed. Darn! My XPS420 is 4 years old and running Vista ultimate. I don’t use the microphone, but I am scared to proceed with the upgrade to Windows 7. One thing I know: with the support provided by Dell, it’s my last Dell system EVER.